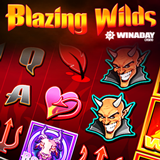 The devilish new Blazing Wilds slot with expanding Wild and free spins bonus has just been introduced at WinADay Casino. In its Free Spins bonus round, the fiendish new game has extra fiery Wilds and prizes on Payline 13 are doubled so this game is hot, hot, HOT! WinADay, which creates all of its one-of-a-kind games itself (you won't find them anywhere else!) is offering introductory bonuses for Blazing Wilds until Tuesday, September 26. You can claim a $13 freebie and a choice of deposit bonuses with various wagering requirements. $13 freebie and choice of deposit bonuses available until September 26, 2017 only. Deposit $50 - $250; 36X wagering requirement. Deposit $25 - $250; 23X wagering requirement; valid for all slots and Keno. Deposit $25 - $250; 20X wagering requirement; valid for all video poker games.